The seasons are a present force. Weather is a being who circles around our lives and we are tethered to its moments. The song, the breath of nature infuses us with its soul…in Vermont. These are not words I would have written while I lived in NYC; but being a Vermonter now, they feel spot-on. When I moved to Vermont I had no idea what I was in for. I had gone to boarding school just a half hour away from Brattleboro and got to know the town a bit when I did an internship at the Brattleboro Retreat my senior year. But being in school and sheltered from the everyday machinations of what sustains us, as I was basically just a visitor, is quite different. I loved the mountains, yearned for them while living in Manhattan. And there could never be too much snow with its footprints left for others to follow on the way to the subway; or better yet, through Central Park. And how autumn, with its own magic of light and color show on the trees that made the sky more present than other City seasons, was my favorite time. But this was not enough. Something inside me hungered to go back north to the intensity of snow infused winters, more outrageous autumns, and summers that were not endlessly beating down upon my spirit. Sweating in a park surrounded by traffic that spewed forth vapor just sent me inside. No playing in the sun for me, although, truth be told, no matter where I live, summer is not my dream date. Have I forgotten about spring, which was just the short, almost unseen prelude to summer? Well, not anymore. And so after 911 I moved to Brattleboro. While that was the catalyst that helped me make my decision, I had been in Brattleboro a few weeks before September 11 with eyes toward relocating… maybe. The realization that I was supposed to be in one of the towers that morning and the only reason I wasn’t was that I had overslept, something I never did, was the final proverbial pot thrown on the wheel, to use a Vermonty vernacular. Yes, Vermont has a lot, as in many, with a capital ‘M’, potters; hence the comic inference is based on quite a clay-laden truth. And yes, now I am known to occasionally oversleep. I looked forward to becoming part of the fray of life in the ‘rural’. But some of us take a little longer and stick out a little more. It is not that we want to; it is merely that we are perhaps odd, even in a city. Maybe because of that a fondness between me and older born and bred Vermonters developed. They have seen it all and accept that it takes all kinds. One wizened ice fisher taught me that even when a lake is frozen in the deep of winter the ice will still creak when you walk on it. This was especially helpful when a certain person, any guess as to whom it might be, was having a fantasy of being some ice pioneer. She did not panic and run back to terra firma; but rather stood solid and rode the sultry moans beneath her brand new snow boots: her heavier than expected snow boots. That fact that I never thought I would say the words metalbestos and Carhartt and actually know what they mean is another thing entirely. But knowing what a Carhartt is does not mean I am going to don one. Might this be why some friends still joke and tell me after 13 years I still look like a tourist? Yes, I wore the reversible, poofy sleeved winter coat that I bought at Filene’s Basement on Broadway and 72nd Street to accompany a friend to purchase a boar for her 3 sows. We drove an hour north in the snow and lured Truffles, she let me name him, the big red porcine pooch, into the back of her Subaru Outback with large dollops of yogurt on a ramp. He snoozed on the way back as I pet his snout. I took the day off from work because when else would I ever do this? One year later I helped her build a shelter for Truffles and ‘the girls’. My second first experience of the porky kind occurred when Truffles snuck up on me and stuck his snout between my legs and threw me up in the air. I landed flat on my back. I wondered if this meant we were dating. But I am Jewish and kosher, so what is a girl to do? Being an active participant and sometime teacher in the Jewish world of the Upper West Side of Manhattan I assumed that my spiritual life would go on as usual, as there is a Jewish population here, although it is small. Again, I had no idea what I was in for. Rural Jewish practice, like much else here, is dictated by the often inclement weather that deters easy transportation and merry making for months on end. An ages-rich instilled early to homestead nightly calling and lots of outside pursuits which run the gamut of serious farming and gardening, to recreational interests can also take precedence. So only having been here a few months before Passover, I found myself on my own. I had spent a few Seders by myself before but that was by choice unlike this time. So determined not to be alone, I happened upon a very different type of Seder, but one I would not trade for anything. It was the first night of Passover; the night of the first Seder. It was also the first night of the annual crossing of the salamanders when they go to the vernal pools to mate. 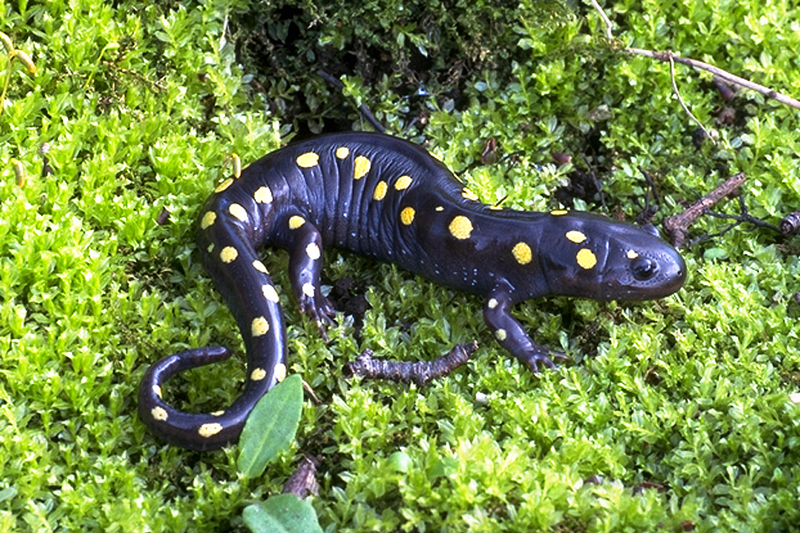 In an effort to save these creatures, BEEC-Bonnyvale Environmental Education Center, organizes groups of volunteers to protect the salamanders and their attending frogs as they cross the unpaved roads to these springtime vernal pools. I was one of those organized. A group of us met with raingear and flashlights in tow. Our task was to slow the oncoming cars so all make the long journey across their muddy desert safely. Recalling the luminous sheen of the salamander’s skin, the darkness vaguely lit by what the sky could offer and the scent of nature’s abundance still deepens my breath. My heart glimpsed the endlessness of time and its fire spark that night. Archetypal images rendered themselves in my mind’s eye. I was filled with the presence of this ancient event that was whirling around in every sense I had. Just as I could feel the deep paths of my ancestors’ exodus laden with slavery’s heaviness; I felt the salamanders’ primal urge that propelled them toward their equally long journey across their dirt road desert. The vastness of each resonated. One side of the road had just a few houses each spaced a distance from one another. Their various grasses and plants came to the edge of the road to meet the dirt and small stones that served as pavement. Beyond this lay the vernal pool, the land of milk and honey, or rather water and algae that was their promised land. The woods from which the salamanders and frogs emerged were on our other side. We kept vigilant eyes on the slope of the road that held the forest at bay, so as not to miss even one. We walked slowly, always with our flashlights pointed toward the ground. What took us just a few seconds to cross, took these beautiful spotted beings many times more. What respect and awe we were all in at the determination and strength we were witnessing. There were times when it was too much to take. Our feelings got the best of us and we would gently pick one up, and with reverence, place them in the grass across the way. We stayed for a few hours, adults and children, and ferried our charges. The sound was all encompassing. While salamanders are silent, almost other worldly; the frogs sing in different tones; some fast and high, others long and low. There were different species each with their own song. I could see my ancestors crossing the Sea of Reeds and almost hear their song. The many trees curved their branches above us forming a canopy that looked almost like stained glass as the moon dappled them with its light. The rain was gentle and added its own harmony as it landed on the leaves and grass. The sounds of the earth and the animals were music of the highest kind. It was not overly cold; it never is on Passover, but the light rain offered an edge that made the importance of this night sharp with focus. We were there to help sustain the ecosystem and, as far as I am concerned, a culture; a lifetime that spanned eons of the same behavior with the same expectations each time. The winter had melted away, the lushness of nature was awakening, and the rains had come. The pools appeared from under the ice and snow that created them. It was now time to emerge and continue life while the land is verdant and moist. All the salamanders that were going to cross that night had already done so. Their exodus ended until the next rainy evening. How poignant that on the first night, my Seder was one that had become animated and played itself out right in front of me. When the last person left for home and to warmth, I stood on the edge of the road that led to the vernal pool where I had placed so many to forge their way through the grass. The mist of the night and continuing songs of the frogs and rain filled the air. I breathed in the deepness of the night. The frog’s dulcet tones began to sound like prayers. I stood still and softened my vision. My feet were grounded to the earth but my head moved slowly back in time. I began, softly at first, to sing Eliyahu’s song. The longer I sang, the more I felt nature and history meld together. This was the embodiment of the Passover story and I felt taken to the center of the energy, the pure essence of this holiday. The connection to history past, the present and the future wrapped itself around me. This was a true Seder. This night was about freedom. The freedom to express one’s true nature, the freedom to express one’s true spirit, and the freedom to feel that there is truly a place for each of us. I made my prayers and went home to have a cup of wine with Elijah. This entry was posted in Essay Thoughts. Bookmark the permalink.